A couple of weeks after the first outing of the EQ6-R Pro, I had a short window of opportunity to use it again. Really encouraged by my first experience with the new mount, I chose a target for evening from one of my astrophotography books and set about getting everything ready. It was going to have to be another short session because it was a school night, but the forecast was clear and that was good enough for me. After polar alignment and 3 star alignment, I came across a problem with PHD2 where during the calibration steps, the selected guide star wasn't moving. I was about to throw a paddy and jack it all in for the night when I come across a little nugget of information on one of the forums. It all come down to the ST4 cable in the guide camera not being pushed in quite far enough. I thought it had clicked into place, and indeed, it wouldn't pull out easily, but it needed an extra push. With the cable pushed in correctly this time, PHD2 sprang into life and calibrated first time. Once calibrated, I run Guiding Assistant for a few minutes, accepted it's recommendations and started guiding. The last time I was out, for the first time I used the smart histogram feature in Sharpcap Pro. This time, I didn't want to use up anymore valuable time because of the delay with the ST4 cable earlier on. So, I loaded the same settings that I used before, achieved a good focus and set the imaging run off. I only had time for an hour of imaging, so set everything up for 20 exposures of 3 minutes each. After sitting for a while making sure everything was working OK, I came back in to get a drink, but when I returned I found that my laptop had rebooted itself mid-run thanks to Windows updates. A lesson learnt there - change the hours to when things can get rebooted! I checked how may frames I had captured, but I only had half the frames I wanted. Guiding had stopped, as well as the data collection during the reboot, but the mount had kept tracking. I didn't want to waste the data I had already collected, so I decided to set up for another run of 10 images. This meant I finished later than I wanted to. I still had to collect my calibration frames, but contrary to good practice, I decided to leave that for the following day. I made sure I kept the focus and orientation of the camera in the scope, and covered everything up for the night. Fast forward to stacking, and PixInsight dealt well with the stacking process given that it was now stacking two different sets of data on the same target. Somewhere in the stacking and processing steps, I have forgotten, or at least missed out steps to counter the glow effect from the sony 183 sensor, but fortunately in this case, the nebula was quite central to the frame so I managed to crop most of the glow out. It's definitely something I need to master though, especially when it comes to imaging larger targets which fill the frame more. So, here's the final image from the positive, but disrupted session. 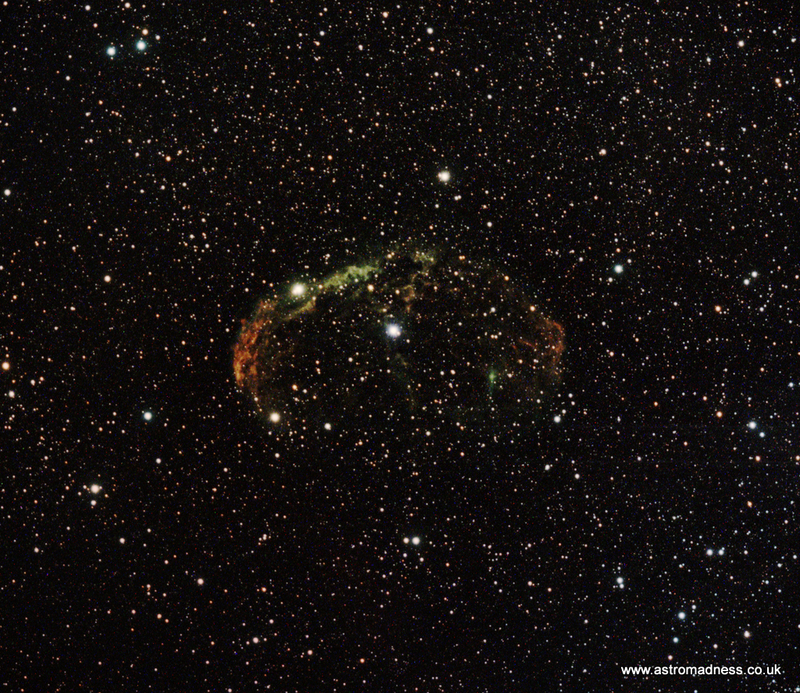 NGC 6888 - The Crescent Nebula.